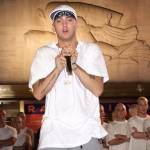 There was a moment in rap history when Eminem made many foes out of mainstream pop culture. This included Mariah Carey, who supposedly dated Shady before the two went back and forth on record. Going all the way back to “Bagpipes From Baghdad” from Em’s Relapse album and Mariah Carey’s “Obsessed” video from Memoirs of an Imperfect Angel, it got really ugly. Even Carey’s then-husband Nick Cannon took shots at Eminem on the “I’m A Slick Rick” diss record. Speaking with HipHopDX Editor-In-Chief Trent Clark, Cannon had much to say about the beef between him and Em. During the interview, he said that Shady’s status within rap didn’t bother him at all. From Cannon’s point of view, he did what any man would have done in his situation. Earlier this month, Cannon was hospitalized for complications from lupus at Cedars-Sinai in Los Angeles and he was released Thursday (December 29). The rapper/comedian/show host released The Gospel of Ike Turn Up: My Side of the Story mixtape in November.